The Federal Reserve Open Market Committee (FOMC) has made it official: After its latest two day meeting, it announced its goal to devalue the dollar by 33 percent over the next 20 years. 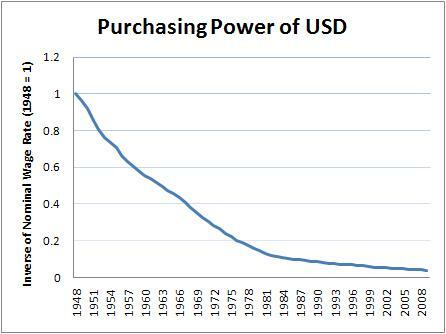 The debauch of the dollar will be even greater if the Fed exceeds its goal of a 2 percent per year increase in the price level. Regular readers will know that I believe that the dollar in its present form is extremely unlikely to exist in twenty years, due to the systemic fragilities of a system softened up by forty years of unrestrained credit creation, securitisation, (including over a quadrillion dollars of derivatives), and a free lunch of Arabian oil and Asian goods rolling off the printing press. Past performance shows the only way is down, down, down. After all, the FOMC central planners determined long ago that deflation — a natural phenomenon that has occurred repeatedly throughout history, and which actually has a useful function of liquidating bad businesses and debts — was bad, and that they were going to print, print, print ’til it was eradicated. Does anyone else think that there might be things worse than deflation? Like — oh, I don’t know — currency collapse? This entry was posted in Economics and tagged bernanke, black swans, currency crisis, dollar devaluation, federal reserve, inflation, ludwig von mises. Bookmark the permalink. When I read your Business Insider quote, honestly, my first thought was that you had made that quote up! No joke! I had to follow the link and read the article twice. To say that the FED has lost their marbles is the understatement of the new century. So that is why the US Share market is rising. The value of the market will rise becuase it will be cheaper to buy a US share with external currncies. Hell if I had double the US dollars because my currency is worth more, I would bid up the current market price 2 times,and feel that I am getting the same value. Note the Australian sharemarket has not moved up, but our dollar is stronger. Is this a correllation or am I mistaken? Is there a graph of the US sharemarket based on a commodity (Gold, wheat, copper, Fresh H2O etc) metric? So while your dollar has strengthening, it is making many of your exports less competitive on the world market. Does this effect the sharemarket (Equities? ), I honestly don’t know. Sweet man! I’ll look into! FOMC are predicting gold at $2200 over the next 20 years. i’d be surprised if gold wasn’t at $2200 in the next 20 months! Oh but Krugman said we should inflate our way to prosperity!!! As Aziz pointed out a while back, Krugman himself has actually talked extensively about the dangers of a rate spike and a “cash crisis that throws the nation into chaos”. He plays both sides of the argument. So does Aziz. All thinkers should play every side of every argument.